Karen W from Heart of the Matter Ministries International is a friend of Word of Grace Church and has been a blessing to us over the years. 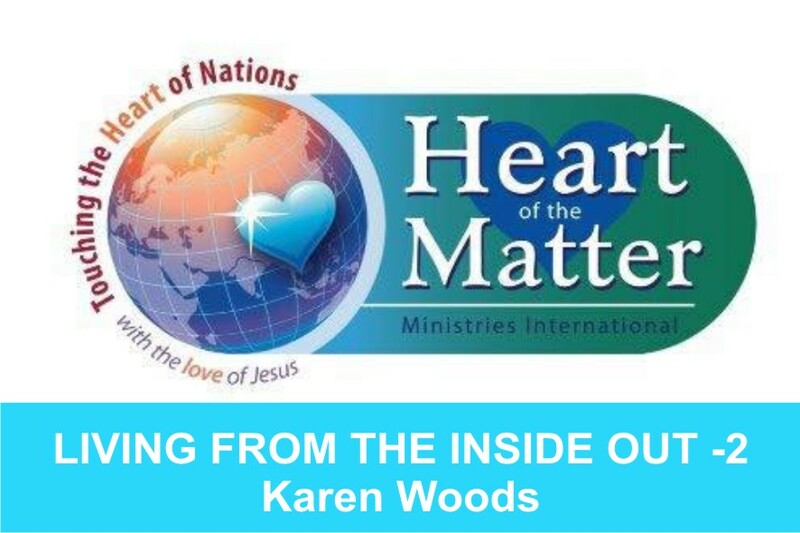 This message was preached by Karen W at Word of Grace Church on July 2nd, 2017. To listen/download the audio please click here. 1. Grace: the church consists of Grace. A caring community must be filled with Grace. It is the relational part of God. You come as you are. Your strengths, weaknesses, secrets, addictions, all of it. Grace is a place where there is no judgment. But Grace and Grace alone is not good. There is no responsibility. 3. Gifts: When Grace and Truth are in alignment, there are gifts. We love the gifts. In churches, when someone is functioning in gifts, people go gaga over it. But gifts without truth is dangerous. I’m partially blind in both eyes. One day, a friend of mine who thought she had the gift of faith like Smith Wigglesworth. So she operated in the gifts without truth. she popped my eye with the palm of her hand. So I prophesy, but I teach people about the truth. even in the gifts we can make mistakes. If I do something wrong, grace says, its okay. With the balance of Grace and truth, the church is able to operate in gifts. We are empowering one another to operate in their gifts. 4. Fruit: When Grace truth and gifts are in alignment, we can bear fruit. Fruit is very important. The church must operate in the attirutes of God to bear good results. The fruit has two parts. One is the attributes of God and the results of what we do. 5. Teleois: it means wholeness, completeness and Christian maturity. A healthy community should contain all there to have wholeness. This is what the Body of Christ should look like over the world. The wisdom of God is in getting along with one another. Relationships are important to God. Q. What are some of the descriptions of kingdom of culture relationships? It is controlled, perfectionistic and judgmental. We often find ourselves doing things according to our cultural norms. So we base our relationship with God on our culture. So there is two cultures. The Kingdom of Culture has a lot of restrictions. Q. What do relationships look like in the Culture of the Kingdom? · Identity- we have a destiny. When we have an identity in Him, we can go deeper in relationship with Him. If everyone is doing the same thing then we cannot grow closer in relationship with God. · Equality: In American culture, we have equality, we have lots of freedom. We can be whoever we want to be. There are people who identify with other genders, with animals, etc. There is more equality for women in this culture. But with freedom comes responsibility. But in Indian culture, there is not a lot of equality. People are treated a certain way based on skin colour, caste, gender, etc. But in the culture of the kingdom, there is equality. When we operate in the culture of Kingdom where God lives, then what God says is truth, is truth. There is some good stuff in every culture. Indians could keep their hospitality, family systems, etc. In America, we love that we can marry out of our race. There are a lot of multi racial situations. Women in the church can stand and flow in 5-fold ministry gifts. So there are some good things in the culture, but the Kingdom of God trumps it all. Where we find our identity is from who gave it to you. Pygmalion’s problem- in Greek mythology, there is a guy named Pygmalion who was a famous sculptor. Historians say his work was so life-like. All the women fell in love with him. But he didn’t like any of them. So he sculpted a beautiful woman. He fell in love with the statue. He brought beautiful silks and pearls to drape this statue. But here was the problem- the statue couldn’t fall in love with him. he created something that could not give life back to him. when we put on people how we want them to act, they cannot give us life back. So that is the kingdom of culture. In India we see commercials on fairness creams. I know 2 people back in my day, when black women would use fairness creams to become fairer. No matter how you look, God made it all and loves it all. My sister bleached her skin because she was ashamed of it. I am yet to see a black-skinned actor in India. So, her skin turned greyish pale and she looked like a Panda bear. When we live in the eyes of Pygmalion, we create images that are not true. Everyone in India doesn’t look white. We come in beautiful colours. So when we get stuck in this, relationship becomes contrived. 1. Acquaintance: as we begin to cultivate relationships, they start at an acquaintance level. 2. Good Friends: someone you meet at church. You probably share what school you went you, where are you from, etc. you wouldn’t share anything deep. 3. Close friends: these people, you are now developing a heart-to-heart relationship. You may tell them your story and a bit about you. 4. Best friends: people who you might have grown up with. They know everything about you. They know your best and your worst qualities. 5. Intimate friends: They know the deepest darkest part of your heart next to God. they may know things no one else knows about you. In this boat, what is interesting is that it is decreasing in size at each level. The boat of your acquaintances is larger, but then it gets smaller because it gets deeper. When you jump from an acquaintance to intimate friends, it reflect insecurity and loneliness. This is not healthy. Q. Why is it not healthy? Healthy Relationships take time. It has to be cultivated gradually. I want to honourably present this- often, arranged marriage on this ship looks like an acquaintance jumping into intimacy. Even online dating can run the same risk. There is a proper way to do arranged marriage where people feel empowered as they begin to grow. But it is awkward when you jump in with someone based on something your family said. I honour it. But we must put it in a healthy way where people can grow into intimacy. So we are going to come back and talk about what Safe and Unsafe relationships look like.